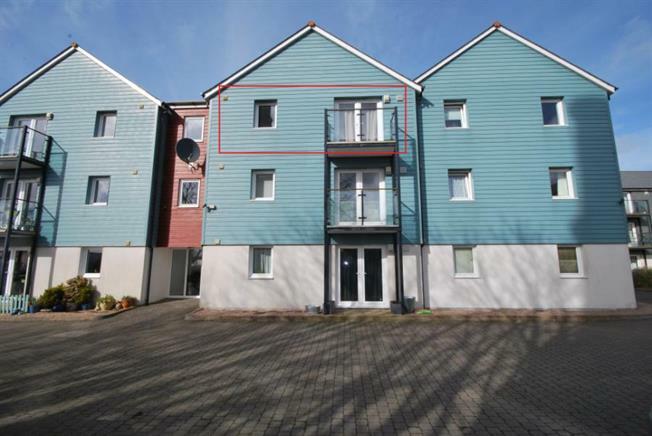 1 Bedroom Upper Floor Flat For Sale in Redruth for Offers in excess of £100,000. Ideal First Time Buyer Of Investment Property. Situated on the top floor of this contemporary development, this one bedroom apartment is well appointed and designed for low cost living. The living space enjoys access to a balcony with far reaching views and the kitchen has a wide range of fitted appliances. There is electric heating, double glazing and the bathroom has a shower over the bath. To the outside there are communal gardens and residents parking. This development is close to the town centre and has easy access to a main line Railway Station. Fitted with a range of eye level and base units with roll top work surfaces, incorporating a circular sink and draining unit, built-in Electrolux oven with Electrolux ceramic hob over, integrated Electrolux fridge/freezer, integrated Electrolux automatic washing machine, combination dryer, extensive ceramic tiling to walls, under unit lighting and spotlights. Enclosed with safety glass, views towards Carn Brea and St Ives. uPVC double glazed window enjoying a pleasant outlook, built-in mirror fronted wardrobes and panelled heater. Fitted with a white suite consisting shower bath with mixer shower over, WC with hidden cistern and circular wash hand basin, extensive ceramic tiling to wall and spotlights. Water heater and useful storage.